This gallery features attic bedrooms, some of which are spacious, and others tucked into nooks. A few of the bedrooms featured in this collection are part of apartments set apart from the main home. Many of these rooms have one or more skylights that pour in light to make these spaces bright, airy, and cheerful. 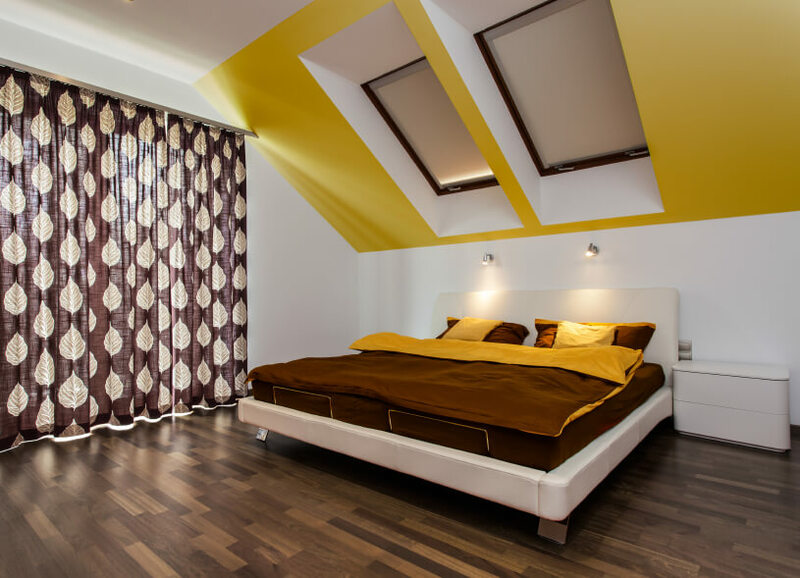 Vaulted ceilings are commonly found in attics, which can have dramatically varying ceiling heights as it is, due to the close proximity to the roof. Something to notice as you peek through this selection of rooms, is the common practice of placing the bed facing away from the window. 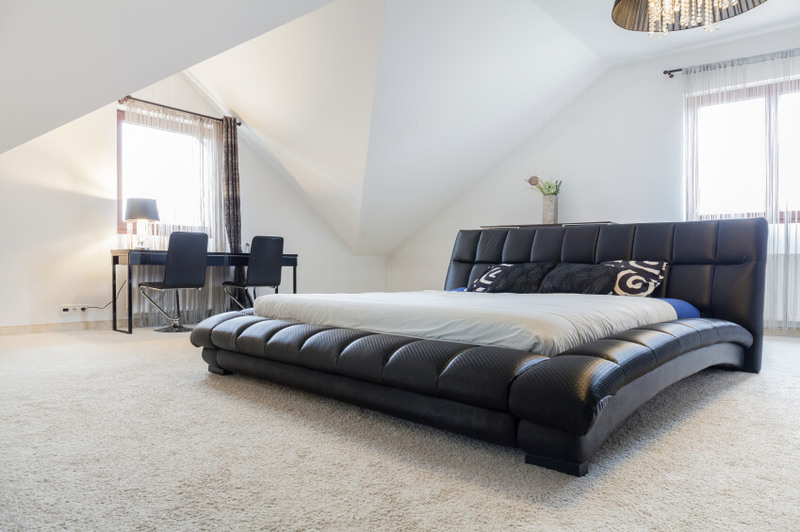 By angling the bed towards the center of the room, you reduce the chance of the occupant feeling claustrophobic. 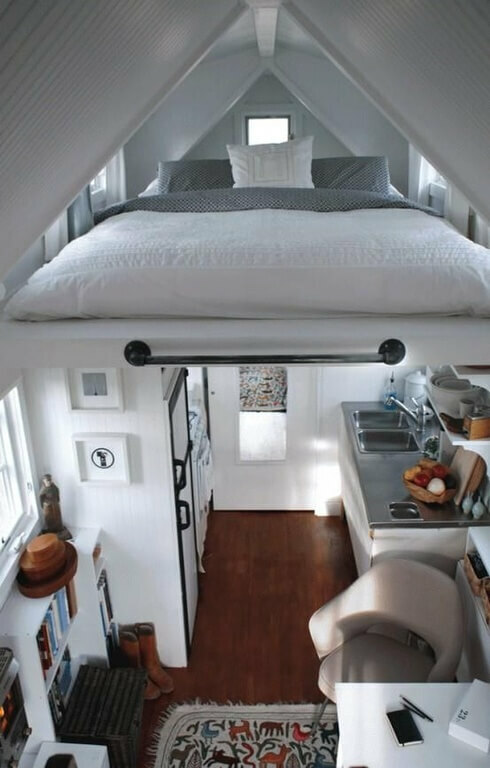 A few of these attics were frugal with their space and created small apartments within the limited space. These were generally open concept areas, but did employ half-walls in their creative layouts. 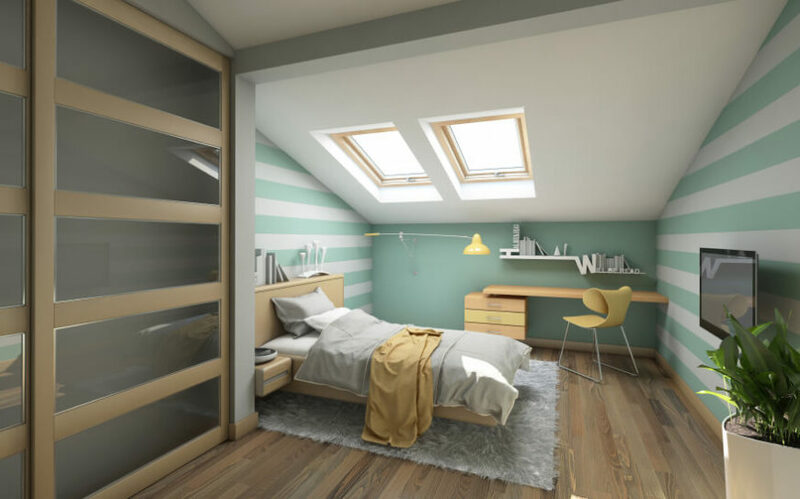 As you scroll through these images, see the clever tactics used for each unique attic bedroom design. 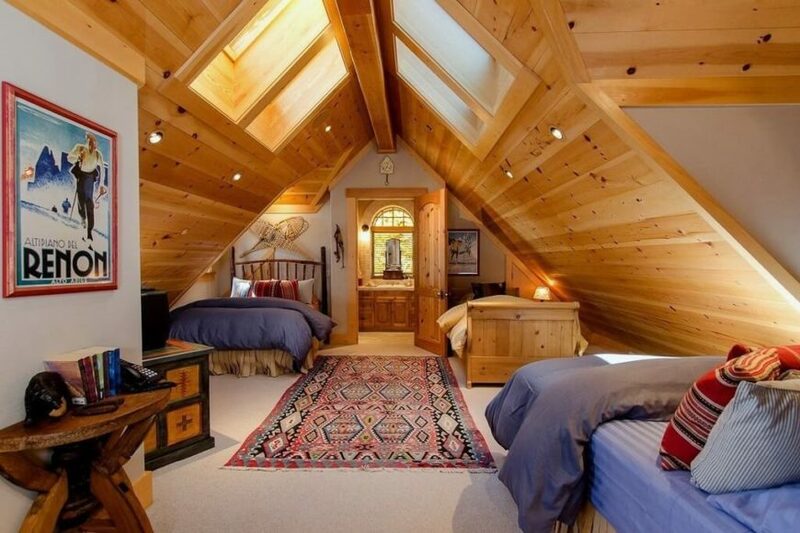 Large attic bedroom at the top of a gorgeous 3-story home. 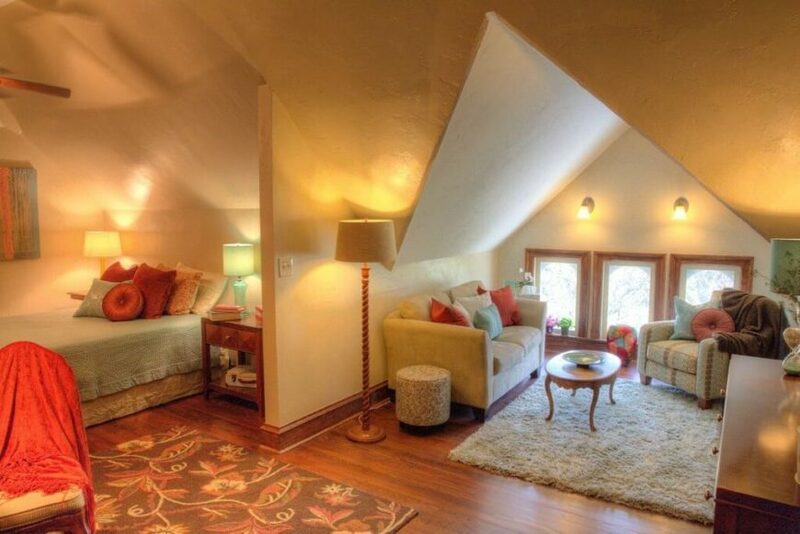 This example doesn’t seem like an attic room because of all the light and decent ceiling clearance. Source: Redfin. See more of this home here. 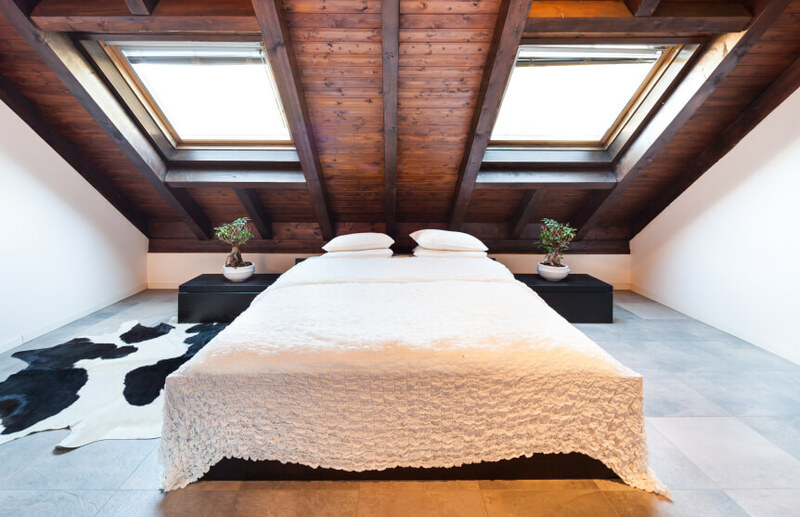 A trio of skylights pour light in from different angles onto the spacious bed. A light color scheme includes natural light hardwood floors. The space is anchored in the complementary color palette of neutrals and natural wood. A bedroom’s exposed beams frame the skylight. An additional window pours in light on the far angled wall. 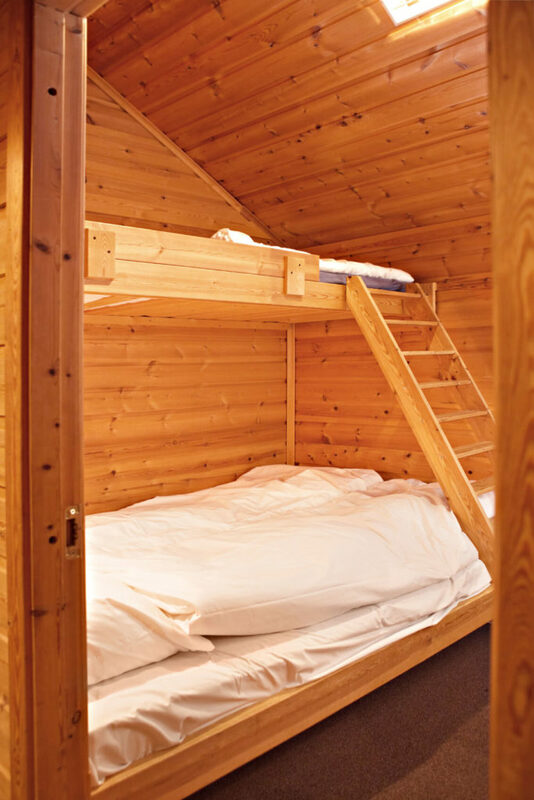 The bed is facing the adjacent bathroom, tucked into the sloping space. 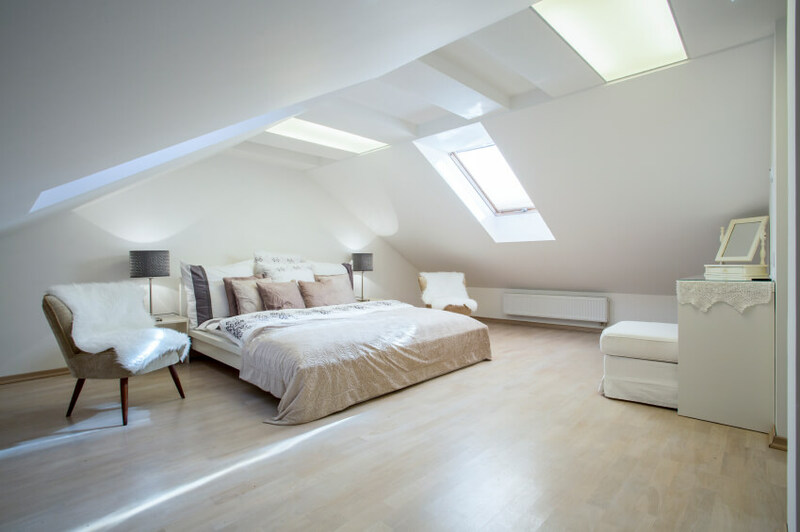 An open concept attic space houses a bedroom, closet, and bathroom. 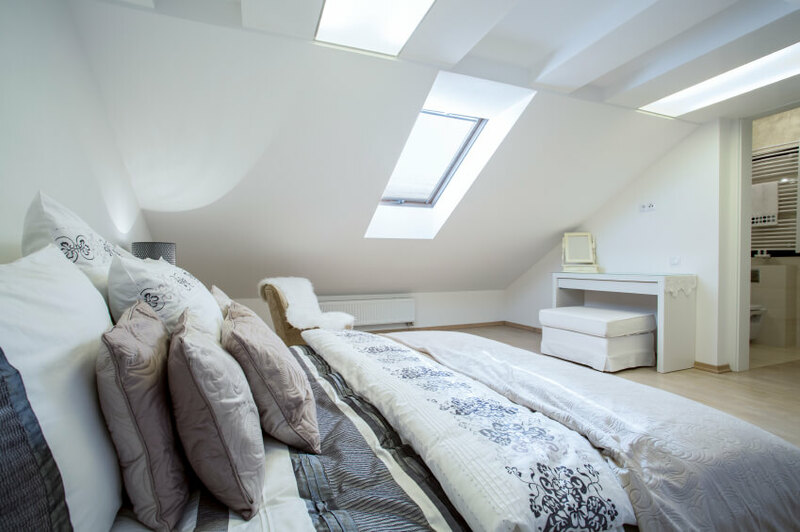 The bed is situated against a half-wall, creating a separate-yet-together feeling to this attic apartment. 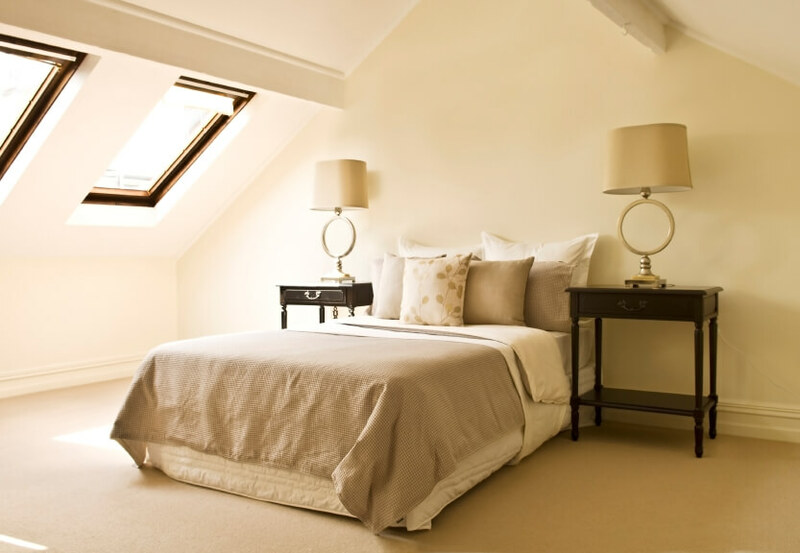 Sconces and cube lights along with multiple skylights and windows create a warm and welcoming attic bedroom. The dark drapery and bed linens contrast well with the light wall color and honey-colored hardwood floors. A bedroom offers a simple cream iron bed frame and a wall of shuttered windows. This clean and simple space also has storage drawers tucked neatly into the walls. 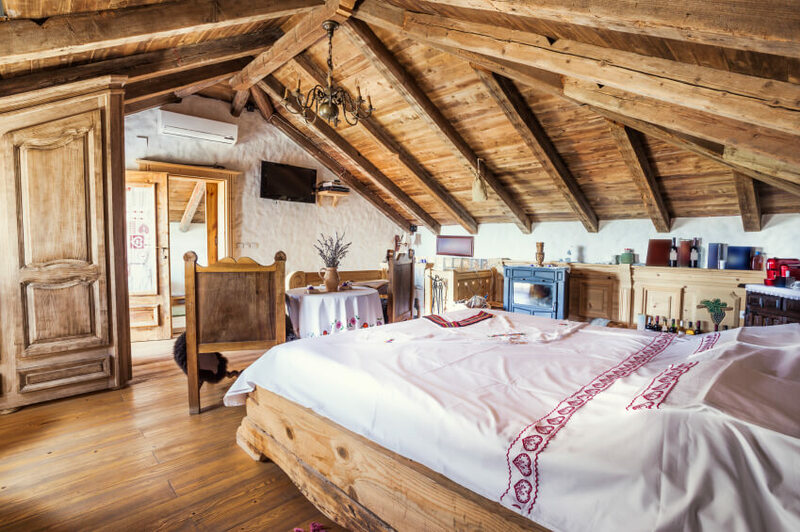 A rustic attic bedroom enclosed by glass barriers on either side of the loft. A soaking tub on white tile runs along the right portion of this bedroom, combining the usually separate bedroom and bathroom into one neat space. 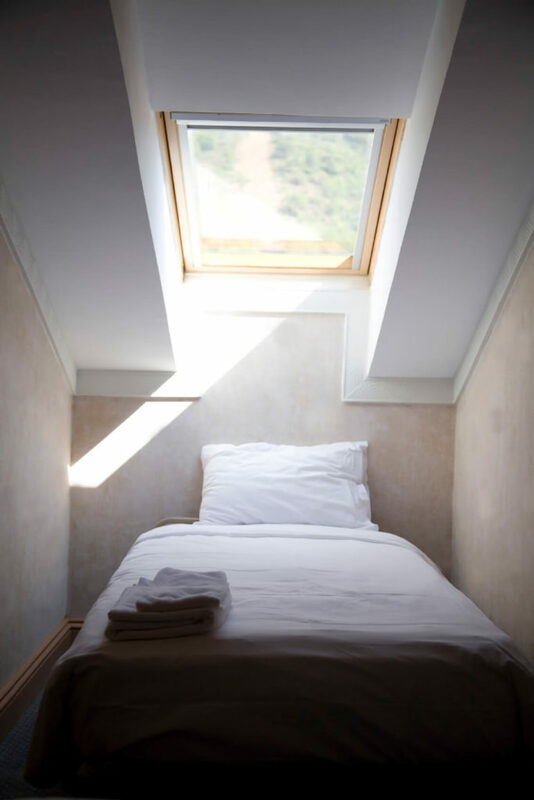 A sleeping area tucked neatly into this attic nook with a large skylight illuminating the space. A white bedroom with beautiful natural wood furniture including the dresser, nightstands, bed frame, and a large chest for additional storage in lieu of a closet. Dark nightstands highlight a neutral color palette and the angle of the ceiling rises sharply in the center of the room. The matching sleek and elegant metallic lamps add contemporary style to the room. 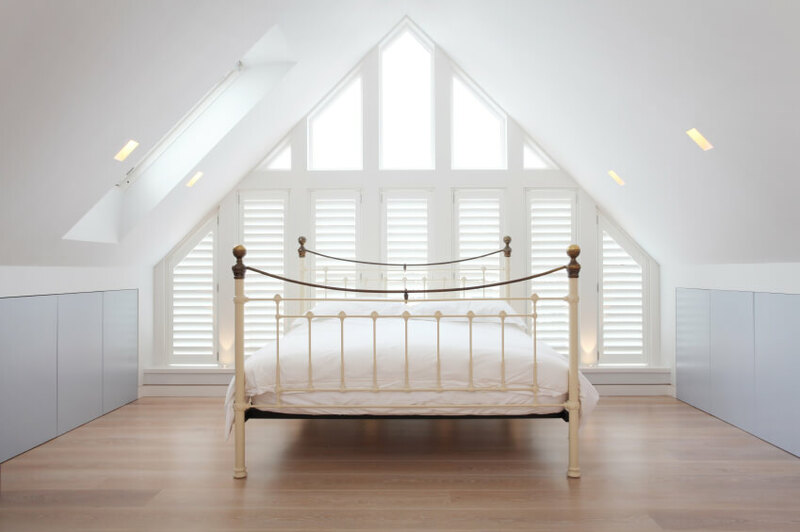 Hopper windows and a softly angled ceiling accentuate the arch of this bedroom. Clean lines and a soft rug continue the minimalist theme of slim, low-profile furniture and natural materials. A white quilted headboard contrasts nicely with the natural wood platform bed. A modern black chair and low sculptural lamps add additional contrasting accents to the neutral color palette. A delicate country bedroom with an adjoining spacious bathroom with a clawfoot tub. A corner door leads out to the iron-railing staircase to the lower levels of the home. This computer-generated image features distressed hardwood floors, ample sunlight, and a spacious layout with bold color and modular furniture. A soft blue wall color is complemented by delicately striped bed linens. A large window gives this otherwise dark space some natural light. A bedroom constructed of knotty pine creates a rustic backdrop for a bunk bed and simple white bedding to put guests up for a night. A mid-century modern bedroom in bold wallpaper and a uniquely detailed door leading out of the space. Built-in cubby holes in the shorter wall provide storage without large furniture. A bedroom that slopes on both sides with a wide center. A pair of double doors lead out of the room. Rich texture and a dark color palette give this space a world-traveller theme. The red plaid bedding and beadboard walls are mixed with bold primary red furniture and a stained dark brown bed frame. A delicate quilted floral pattern on the bedspread is complemented by the more overt floral roman shades on the window. A bold bedroom in shades of magenta, violet, and silver. The heavy filigree around the mirror on the left side of the room adds bold elegance. Dark stained wood, cowhide, and a ruffled bedspread create a contrast of masculine and feminine styles. Bonsai trees on either side of the low profile bed frame add Asian flair to the design as well. This bedroom features ample sunlight, a soft shag rug, and a pastel color palette of yellow and mint. 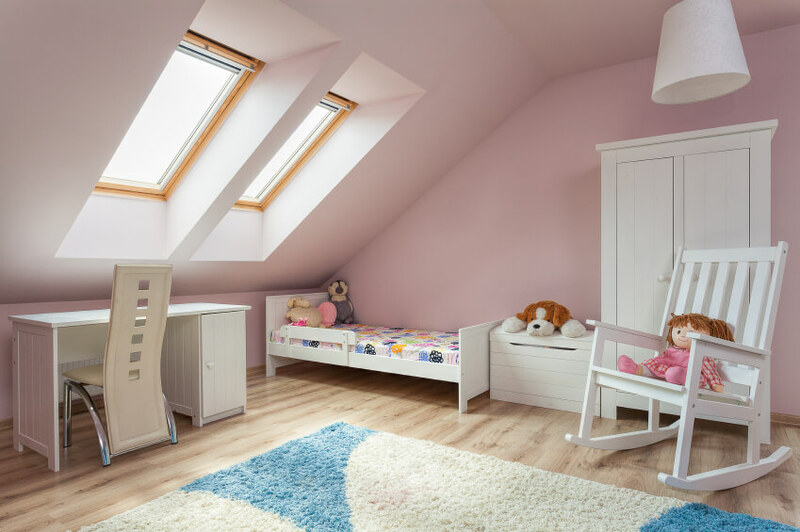 A sweet child’s room in pale pink and white. The rocking chair appears to be oversized in comparison with the miniature bed tucked into the corner. A computer-generated image of a bedroom features graphic wall art, color-blocking, and a cream leather platform bed. Two-toned bed linens are complemented by an accent ceiling and foliage drapes. A sleek white platform bed with a textured headboard is combined with a wild zebra pattern, black nightstands, and rich red-toned wood floors. A charming shabby-chic bedroom with mismatched wood furniture and delicate linens with embroidery. A simple bedroom on a tatami mat and a row of books along the back wall. A fantastic faux leather platform bed with curving sides is the focal point of this mostly white bedroom. Sheer curtains cover the large windows. Master bedroom in attic with two skylights and hardwood flooring. 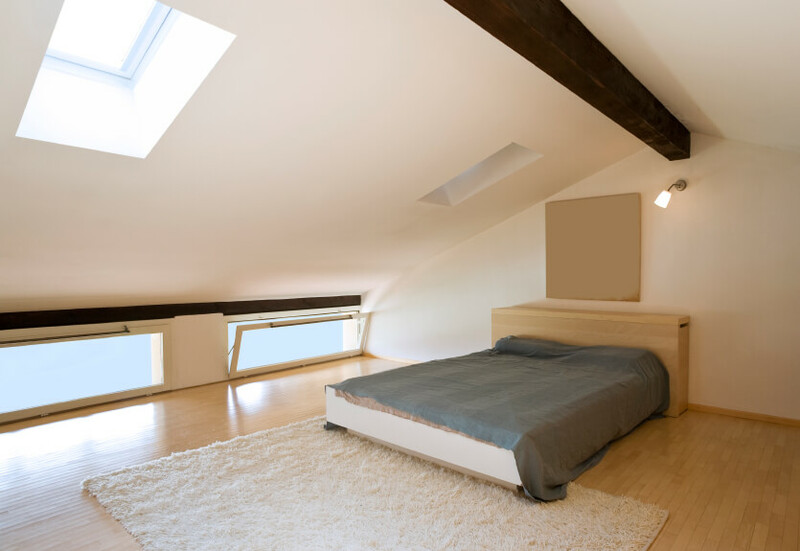 Minimalist loft bedroom with 4 skylights and white walls. 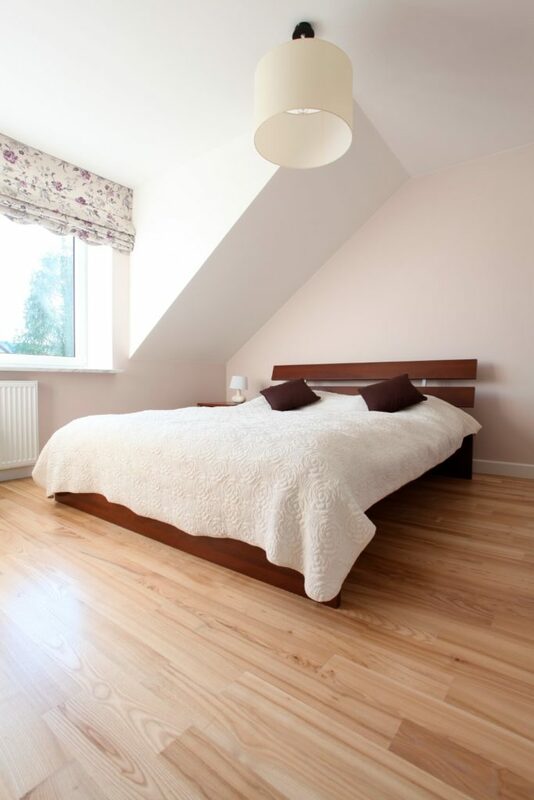 Large attic bedroom with wood ceiling, en suite and sitting area. 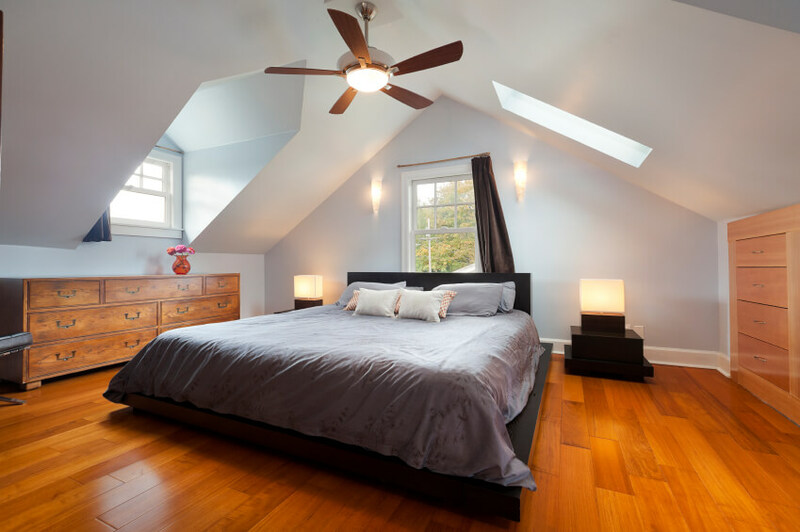 Stunning master bedroom in attic with skylights, new wood flooring and recessed lighting. Close up of bed in master bedroom under 2 skylights. Sparsely furnished bedroom in attic with platform bed. 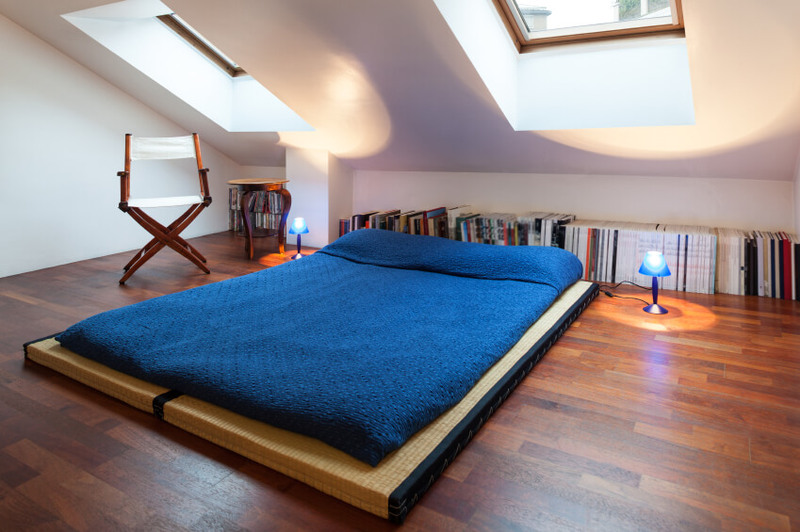 Stylish loft bedroom with blue are rug and large new bed under skylight. Spacious loft bedroom with wood ceiling beams and brick wall. 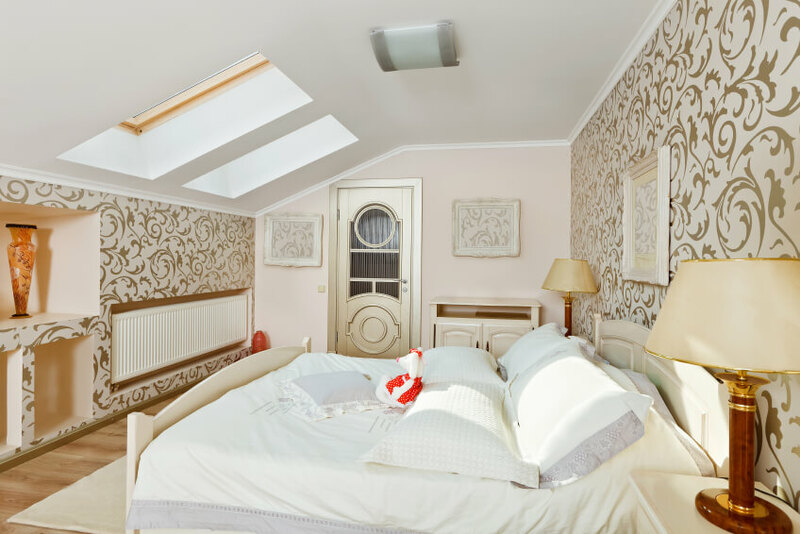 Small attic guest bedroom with one skylight. 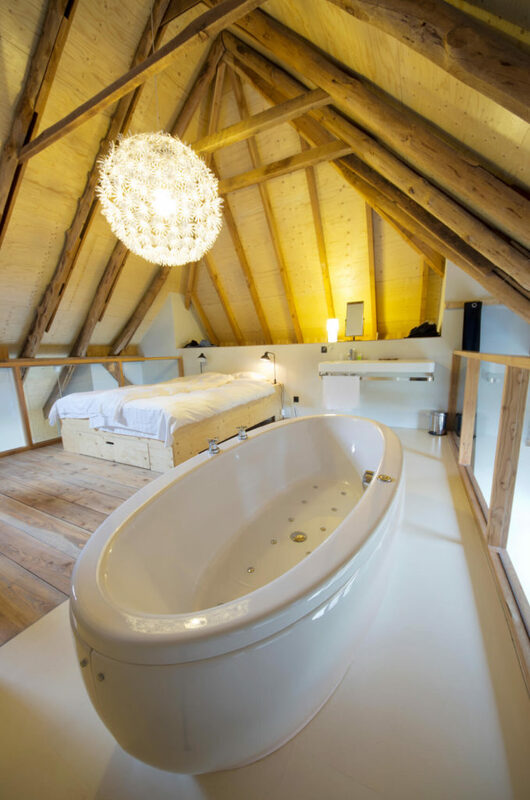 Spacious Scandinavian style attic bedroom with sitting area, wood ceiling beams and several windows. Loft bedroom with hardwood flooring and wall-mounted TV. 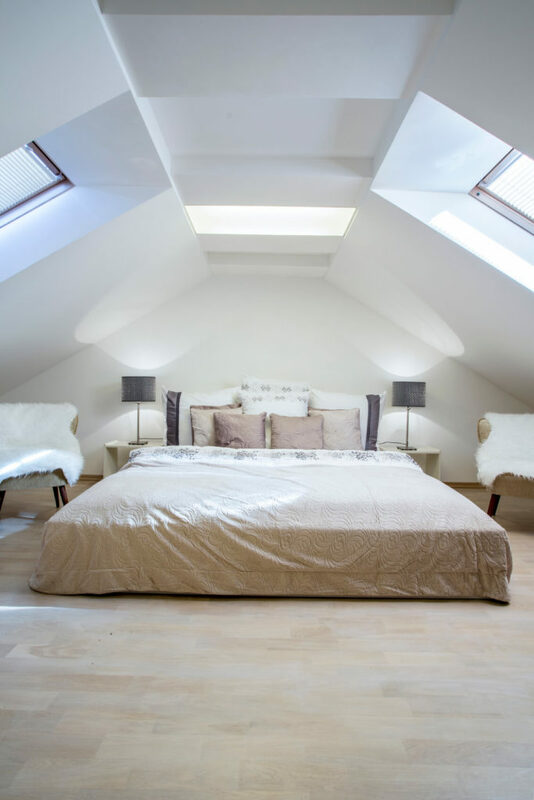 Gorgeous attic renovated master bedroom with white walls and ceiling. Bed flanked by stylish Mid Century modern chairs. Large minimalist loft bedroom with skylights and white walls. 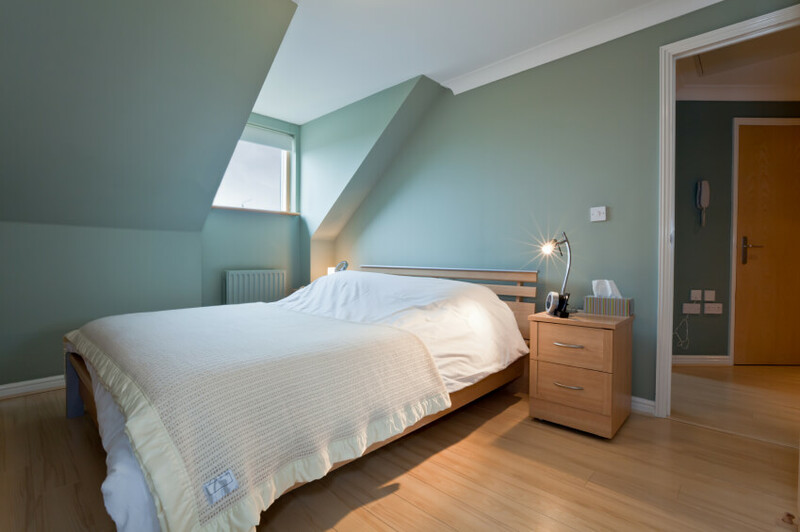 Large guest bedroom in attic with green walls, white ceiling and skylight. Huge loft bedroom with new hardwood flooring and entertainment system. Sensational renovated loft master bedroom with dark green walls, skylights and light wood flooring. 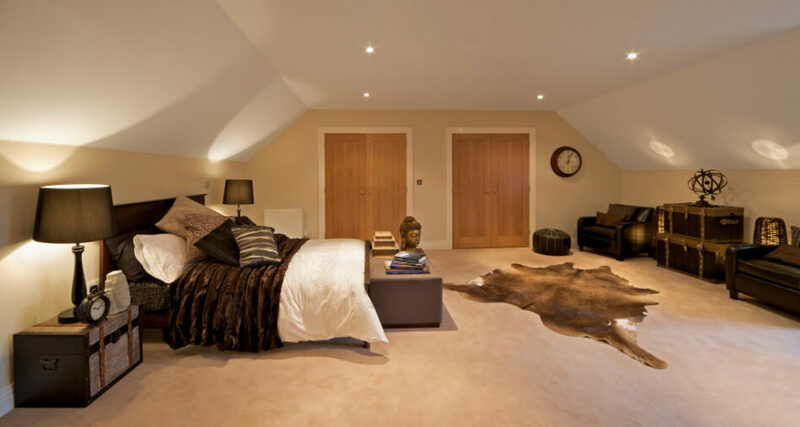 Master bedroom in attic with towering angled walls creating cathedral ceiling effect. Rustic attic bedroom with dark wood paneling and small desk. 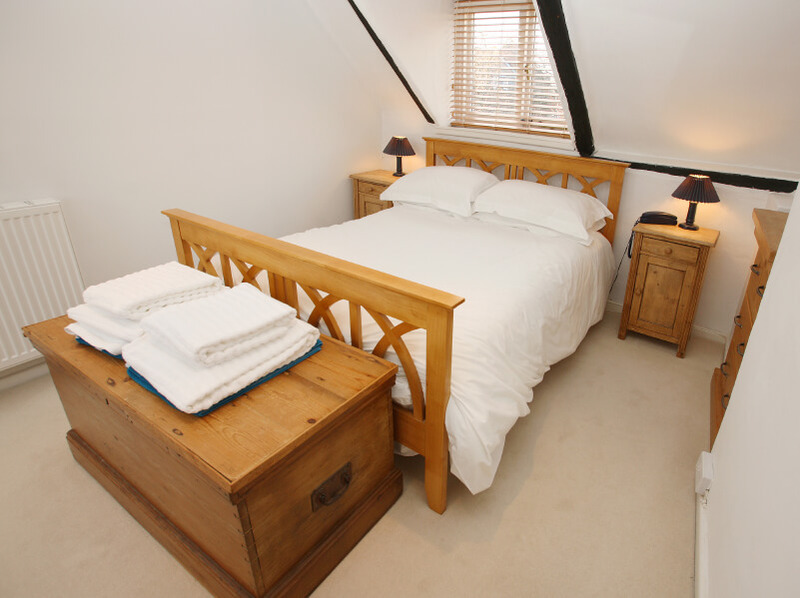 Gorgeous bedroom in attic with sleigh bed, skylight and built in cabinetry. 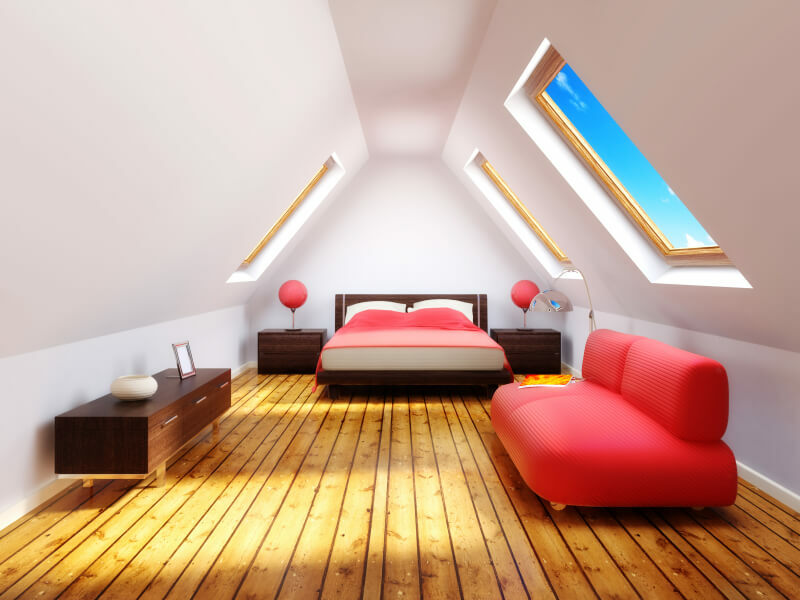 Modern style guest bedroom in attic with all white bed, white walls, white ceiling and skylights. Southwestern style loft bedroom in attic with exposed ceiling beams, arched window and amazing wood flooring. 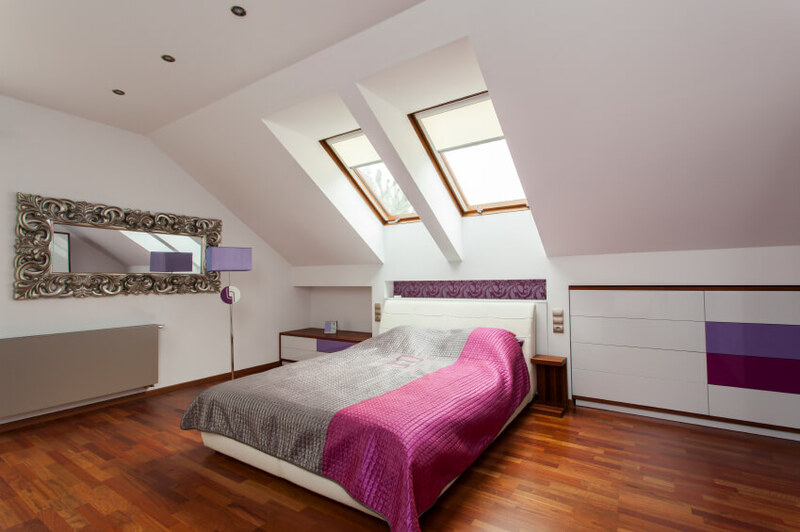 Stylish teenager bedroom in attic with skylights and hardwood flooring with purple and gray bedding. Blue attic bedroom with skylights set in white ceiling. Includes large double door closet. Sparsely furnished, minimalist loft bedroom with two skylights, wood flooring and black bedroom furniture (black bed, bedding and nightstands). Huge guest bedroom with skylights, light wood flooring and open concept bathroom.